I have not been baking much these days. I am consciously avoiding sugar so I am not too eager to have a lot of sweets hanging around the house. Many of my co-workers are also avoiding sweets, so I don't want to sabotage them by bringing what I don't want to eat to work with me. But I am still interested in baking and do not plan to give it up entirely! I made an exception over the holidays and made a few batches of cookies. But since I am baking so seldom now, I decided not to make all of my usual holiday treats. I did prepare a batch of my Mexican Wine Cookies, as the holidays would simply not be the holidays for me without them. But for the rest, I wanted to try some new recipes that I had been looking at for a while. One of them was these wonderful Molasses Spice Cookies that have come closest to the Archway Cookie I have been trying to replicate for the past few years. To say that I was pleased with how those came out would be quite the understatement. They were soft and moist and full of that rich molasses flavor that makes them so distinctive. 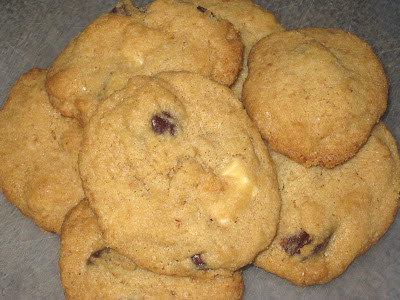 The other cookies I decided to try were these Brown Sugar Chocolate Chunk Supreme Cookies. One of the main reasons I chose this recipe is because I have quite a few packages of dark, semi-sweet and white chocolate that I bought not long before I decided not to eat sugar and they have been sitting on my pantry shelf growing dust for the past year. This recipe calls for both dark and white chocolate chips and that seemed to me to be a great way to put them to use. This recipe is similar to the chocolate chip cookies which most of us grew up eating, with a few key differences. The main difference is that there is no granulated sugar in this recipe. Instead, it uses both light and dark brown sugar. There is a higher butter to flour ratio as well, and it uses both baking powder and baking soda. The end result is delicious. The cookies are light and crumbly. They do not have that chewy consistency that is so characteristic of chocolate chip cookies, which might be a deal breaker for traditionalists, but what is lacking in texture is more than made up in flavor to me. They make for a lovely treat and a nice departure from the usual when you are looking for something special. Preheat the oven to 375 deg. F. Line several baking sheets with parchment paper and set aside. Thoroughly stir together flour, bakig powder, baking soda, and salt and set aside. Place butter in the bowl of an electric mixer and beat until lightened. Add the light and dark brown sugars, and beat until fluffy and smooth. Beat in the egg and vanilla. Beat in the dry ingredients. Add bittersweet chocolate and white chocolate and stir until distributed throughout. Drop dough onto baking sweets by heaping teaspoonfuls about 2-1/2 inches apart. Place in center of the oven and bake for 9 to 11 minutes, or until edges are lightly browned. Reverse baking sheets from front to back about halfway through baking to ensure even browning. Be very careful not to overbake. Remove from oven and let stand for 2 or 3 minutes. Using a spatula, tranfer cookies to wire racks to cool. Store in an airtight container for up to 3 or 4 days. Freeze for longer storage.